Mr. Burr inquires about sending a girl he met in the Sand Mountain area to the Berry Schools. He asks about work, daily routines, religious work, and cost of books and other supplies. Letter discusses scholarship options and policy. 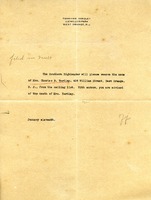 A Southern Highlander is sent along with this letter. 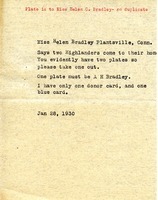 Note says there is only one donor card but there must be two plates for Helen C. Bradley so two copies of the Highlanders are sent to her home. 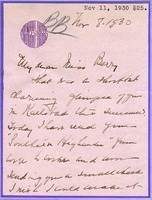 Miss Bradley writes to send $5 to the Berry Schools and says that she receives two copies of the Southern Highlander each time it is sent so she asks that her mother's name be removed from the list so that her family only receives one copy. 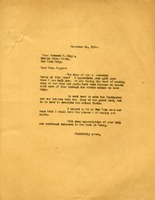 Madge sends a check and asks for the blue and silver book. She asks for an update on how everything is going and how Miss Berry is. 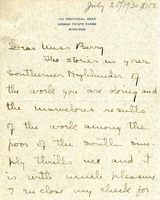 Letter tells of a check the author is sending Miss Berry. Miss Berry thanks Mrs. Biggs and says that they work hard to tell of their great need in the Highlander and other letters but it's hard to describe the actual facts. 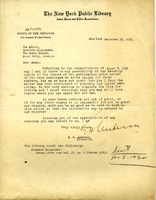 E. H. Anderson writes to the Southern Highlander to try and secure copies of issues of the Southern Highlander for the library. If there are is no way to grant the request they wish to know so it can be put on record. Request to remove Mrs. Yardley from mailing list. 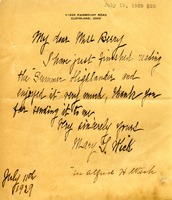 Mrs. Wick writes Miss Berry to thank her for sending the "Summer Highlander" and to say that she enjoyed it very much. 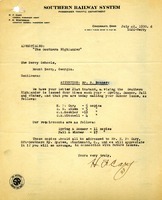 The typewritten note at the top indicates that Mrs. Wick also sent a donation of $25. 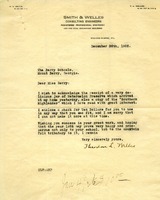 Theodore Welles writes Martha Berry to thank her for the jar of watermelon preserve and a copy of the Southern Highlander. He also sends a check for $10.00 for her to use in her work at the school. Mrs. Watson encloses a check donation for Martha Berry and reflects on when they first met at Battle Creek. Mrs. Watson also says she enjoys reading The Southern Highlander paper and thanks Martha Berry for the cotton she sent Mrs. Watson. 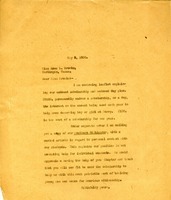 This letter is sent from 225 West 86th St., New York City, NY. 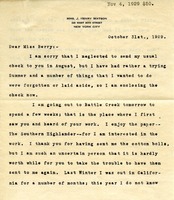 Mrs. Twilley thanks Miss Berry for the Southern Highlander and says that she hopes she can help in the splendid work as soon as she can.